Do you a great work ethic? Do you want to do menial work with boring people indoors? No! Come work with us, where you can meet new people every day while having fun and being professional. You’ll gain new skills and experiences that you can use for the rest of your life while working at Delta Force Paintball Ottawa. You will be working with people who are full of energy, customer focused and ready to help out whereever they can. The aim of a Delta Force paintball marshal is to make sure every player gets involved & stays safe. You need to be able inspire and energise the players, get everyone in on the action, make sure everyone is staying safe and playing fairly. 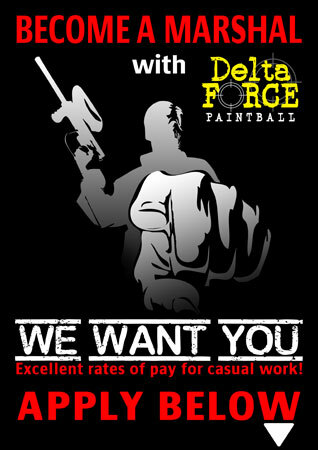 One of our current team members explained the experience of working at Delta Force Paintball quite well, read his testimony. Work History: a Canadian who has worked for Delta Force in Canada now for five years. “I was originally introduced to Delta Force Paintball as a player when I was 15. Even at such a young age I recognized the difference that Delta Force provided compared to regular paintball providers. The predominantly weekend work was ideal as I worked my way through college and I have now progressed to full time employment. I love the outdoors and the thought of sitting behind a desk 9-5pm scares me. Working at Delta Force has allowed me the chance to develop my skills and confidence. Skills like stripping and cleaning guns, using an air compressor to refill tanks, a whole variety of general maintenance duties around the center, too many to list here. If this sounds like something you’d be good at, apply now.